For consumers and automakers eager to “sense what’s coming” in vehicle technology, Magneti Marelli will display a wide range of smart, streamlined, high-tech and safe solutions during CES 2018, January 9-12 in Las Vegas. At its 6,000-square-foot exhibit area in Latour 5-7 at the Wynn Hotel, Magneti Marelli will showcase its market-ready technologies in electronics, automotive lighting, and alternative powertrain, with a focus on autonomous driving, advanced HMI, connectivity and hybrid/electric mobility. Magneti Marelli’s solutions uniquely address three areas of the car that are changing rapidly. Booth visitors can see first-hand the technology that will enable vehicles to: sense and connect with what’s around them, display critical feedback to drivers and passengers, and meet stringent environmental and safety requirements. Laser and double projection headlamps will be on display, along with an all-LED tail lamp and an OLED tail lamp prototype. 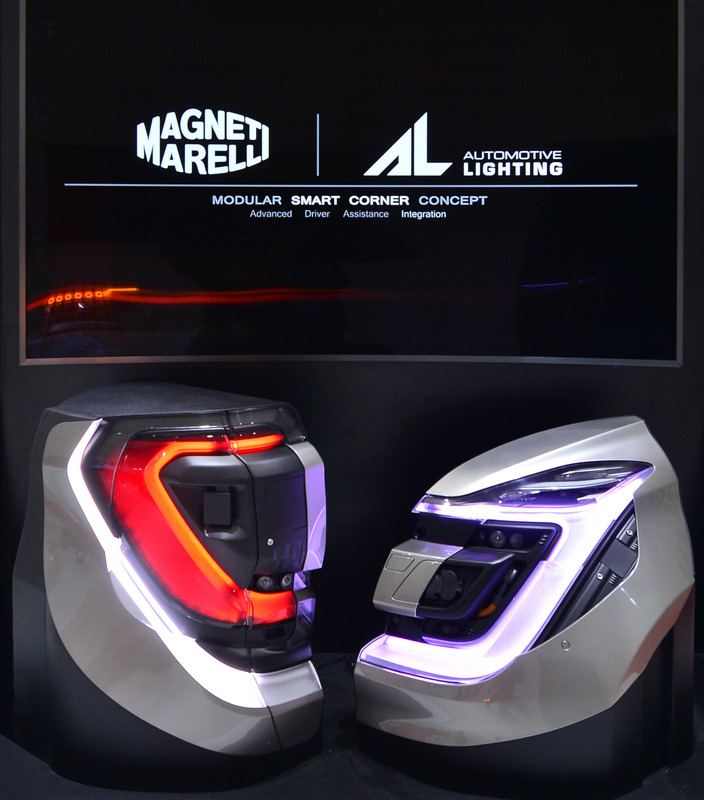 Magneti Marelli will feature a variety of displays, ranging from low-cost designs to a full door-to-door display with controlled content distribution. The company’s Portal Showcase provides content for everyone in the vehicle, incorporates AMOLED (active-matrix organic light-emitting diode) technology, and a thin 1.5mm thick display bonded to a curved surface. Analog, hybrid and full digital instrument clusters can also be seen in the booth. V2X technology can prevent 80 percent of all accidents for unimpaired drivers, according to the U.S. Department of Transportation, by alerting them to dangers that conventional onboard equipment cannot detect. Magneti Marelli’s V2X solutions expertly integrate driver warnings within the HMI, displaying them in the instrument cluster or center stack. Magneti Marelli’s industry-leading traditional and alternative powertrain solutions are derived from nearly 100 years of experience in motorsports. Proven in the harsh conditions of Formula One racing worldwide, the company’s systems are adapted to meet the needs of the commercial vehicle market. One of the most novel outcomes, which will be on display at CES, is a mild hybrid 48 volt belt starter generator (BSG), an electric motor with integrated electronics that replaces a standard alternator. The BSG recuperates energy from braking, driving it back to power the internal combustion engine (ICE) and electrical systems. Coming in at 400 volts, Magneti Marelli’s power inverter module (PIM), supports medium range electric mode driving, up to 30 miles or more on a single charge. It is built to withstand harsh vehicle underhood requirements, such as high temperature and vibration, which is difficult to achieve with integrated power electronics all within a class-leading envelope.